Anchored Booster seat used with lap sash seat belt or Child Safety Harness. Suitable for child 4 to 7 years or 18 to 26kg. Narrow width booster. Anchored Convertible Booster seat. (A) Suitable for use with inbuilt harness 6mths to 4 years or 8 to 18kg. (B) Suitable for use with lap sash seat belt or Child Safety Harness 4 to 7 years or 18kg to 26kg. Convertible Restraint (A) Rearward (0-12kg) Birth to 1 year or (B) Forward facing (6 months & 8kg)to (4years or 18kg). Multiple Hire Rate: less $10 per restraint. The Capsule King hires a range of Child Restraints manufactured & sold by Safe_N_Sound. The types used meet a wide range of needs for children of different ages & size. All Child restraints hired meet the current Australian Standards. A number of the restraints available have been independently tested & rated by the NRMA & RTA in terms of Crash Test Performance & Ease Of use. The results of these evaluations can be viewed at RTA & NRMA. 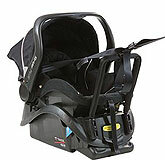 Child Seat Hire is usually only economical for short-term requirements. It usually suits people who have relatives coming in from inter-state or overseas, or people who only require a restraint for an urgent need. The period of hire can be from as little as 1 day or for as long as you require. The Capsule King Guarantees the Quality & Cleanliness of Child Restraints. All Child Restraints used are current standard with an inbuilt easily adjustable 5 point harness system.All Covers used on Child Restraints meet the current standard. They are maintained & kept in good order. All Covers & foam Under lays are cleaned with anti bacterial washes & rinses. All Child Restraints are properly cleaned & maintained with hospital grade disinfectants & sterilization products. All Child Restraints are inspected when returned to ensure that they are in good order. All Child Restraints are numbered & listed on our Data Base. The Date of Manufacture is recorded. Child Restraints have a theoretical “USE BY DATE” of 10 years from the date of manufacture. All Child Restraints reaching the Use By Date are destroyed & replaced. We recommend that you book in as soon as you know the required date for use.